Stormont Building. Picture By: Colm Lenaghan/Pacemaker. There have been calls for the details of any "accommodation" agreed in talks between the DUP and Sinn Fein to be published after the process collapsed on Wednesday. SDLP leader Colum Eastwood expressed anger and disappointment at the statement from Arlene Foster calling on the UK Government to intervene in Northern Ireland affairs. He said: "We have to get back to working together. We have to not allow this moment to be the destruction of all that we have achieved. "Equally we can't allow this British government or this DUP to think that they are going to govern Northern Ireland on their own. That cannot be allowed to happen. Mr Eastwood said they would be making it clear to "anyone who will listen" that it could not be the "DUP having the whip hand". He described the DUP's position within the Westminster government as "very powerful". The SDLP leader warned that if the institutions fall, it would be "very, very difficult" to get them back up and running. "It's easy to pull this place down. It's not that easy to put it back together again." He was also hugely critical of the British government's handling of the political crisis. Mr Eastwood added: "They have allowed two parties to have complete cover, to have complete control over this process, they have not involved anybody else, it hasn't been transparent. Ulster Unionist leader Robin Swann said there needed to be further clarity. “Here we are again. This talks process has ended in another shambles. This is what happens when you allow an exclusive two party process to fester. It has resulted in stalemate, polarisation and failure. 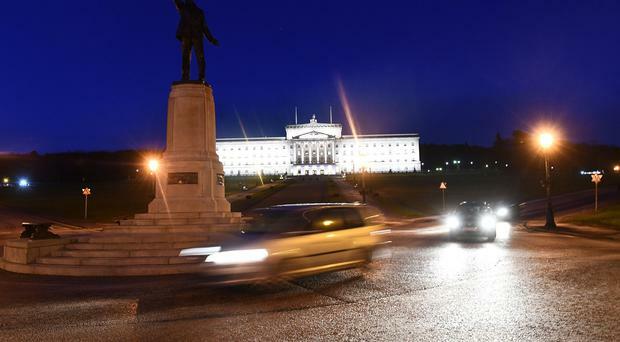 "We need to know and what Northern Ireland clearly needs to know, is the door to devolution now firmly closed or is there still a possibility of it being open? "If Her Majesty's government needs to bring in a budget now, let them do it," said Mr Swann. "Northern Ireland and its people can no longer be held to ransom by those who don’t have their interests at heart. We have neither direct rule nor devolved government. That cannot continue. If we are at the stage where a budget has to be set again in Westminster, so be it. "The DUP and Sinn Fein should now have no fear in publishing what they have agreed so far. Print it, publish it online – do it whatever way they want, but it is vitally important that the people of Northern Ireland know what ‘accommodation’ they did reach. "It's time for openness and transparency and for both parties to let everyone know where they got to, outside a select few in the leadership of each party. It`s time to front up. And if they won`t do it then the Government should print what it knows. “The DUP and Sinn Fein need to take responsibility for their own decisions, explain clearly how they arrived at those decisions and why." Alliance Party leader Naomi Long said: "We are in a very precarious position at this point in time, essentially in uncharted territory. "We have now no prospect of a deal but also no process in place that could lead to a deal nor do we have any indication of willingness by parties to continue any such process." She said political investment in devolution had been "swept away" over the most "minor of differences". “It is now incumbent on the British and Irish Governments to come up with a way forward, because Northern Ireland has to be governed but a switch to Direct Rule does nothing but aid the DUP. “Alliance has repeatedly said from the start of this talks process that without a more structured approach, we would not see a successful outcome. Despite constant reassurances from both Governments we were misreading the situation, it now appears everyone has been led a merry dance and we will have no agreement.